Happiness, that is what you want to feel for so long. There are smiles and there are laughs but you never really felt the genuine happiness. With that, you realized that maybe you should move forward and try to find your happiness. Although you know that it is not easy to find, you are still ready for the challenges that you might face. Well, you should be because there are lots of those. First are the puzzles as you try to find the happiness. You must release the inner monkey in you and try to be enthusiastic with everything. You also have to move fast and wise. Since there are lots of puzzles, you need to use your logic to solve all of those. On the good note, there are clues that can help you with those so you don't need to worry too much. Another good thing is the fact that there are objects along the way that you can collect. Those things can help you with your adventure so you have to pick those up. 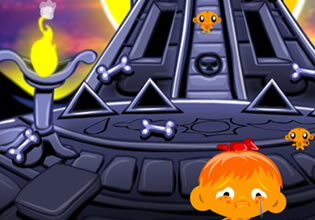 Monkey Go Hapy - Stage 221 is a brand new point and click adventure game by Pencil Kids that will test your logic. Good luck!